we all know what Critical Path means. It is path in which, if any Activity is late, the whole Project is late. 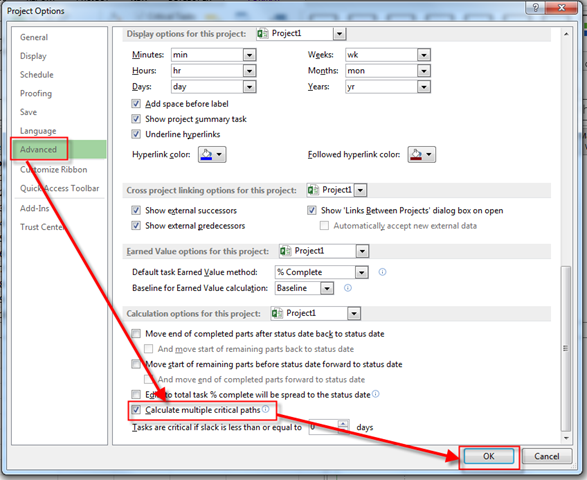 Let me show you Critical Path in MS PROJECT 2013. As you can see, Critical Tasks (or Activities, to be more precise) are: Task 1, Task 2, Task 3, and Task 4. Now I have two Critical paths! I seem a confuse a little bit because with this option, if it is turned on, the late finished date for tasks with no constraints or no successors are set to their early finished date, so they are Critical! My suggestion is: Do not use this option! I’m tracking only one Critical Path, the real one! This entry was posted in MICROSOFT PROJECT, Microsoft PRoject 2010, Microsoft Project 2013, MS PROJECT 2010, PMI, PRoject Management and tagged Microsoft Project 2010, Microsoft Project 2013, Micrrosoft Project 2013 - Critical Path, MS PROJECT, MS PROJECT 2010. Bookmark the permalink.